Modine High-Efficiency II™ Gas-Fired Unit Heaters Are Quick To Install, Easy To Use And Offer Excellent Thermal Efficiency. Modine High-Efficiency II™ Gas-Fired Unit Heaters are constructed of a 20 gauge aluminized steel cabinet housing with a corrosion resistant baked-on, powder coat finish and aluminized steel heat exchanger and burner for long lasting durability. Power-exhausted unit heaters provide 80% thermal efficiency to maximize seasonal heating through collector box and power exhauster. Used for commercial or industrial applications requiring high input ratings. Vented vertically or horizontally and power exhaust can be rotated 180°. 100% shut-off, intermittent pilot-ignition system with continuous retry. Safety pressure-switch assures safe venting conditions. Operates against 0.5 inches of external static pressure. 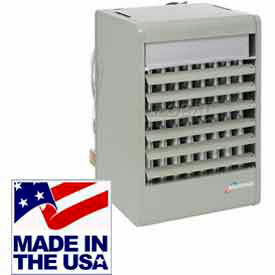 Includes adjustable louvers, control terminal board, gas controls and fan delay timer. Unit heaters can be field-converted to propane using optional Conversion Kits. Level hanging mechanism allows easy field adjustments. Must be installed by a licensed contractor. Input BTUs/H are 150,000 to 400,000 Output BTUs/H are 120,000 to 320,100. ETL Listed. 10 Year Limited Warranty on Heat Exchanger, 1 Year on All Other Parts. Beacon/Morris® Unit Heaters Are Highly Efficient, Extremely Durable Gas-Fired Alternatives To The Traditional Clam Shell Design. Beacon/Morris gas-fired unit heaters are made with aluminized steel housing with baked enamel finish for long lasting durability. Propeller type unit heaters combine tubular heat exchanger and inshot burner technology for optimum performance. Hot Surface Pilot Ignition System provides 83% thermal efficiency. Easy Access Control Panel provides ease of use. Must be installed by a licensed contractor. 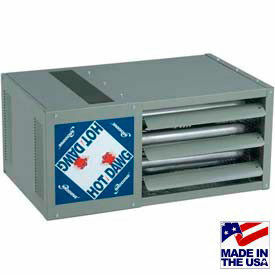 Heaters available in Natural and Propane Gas styles. Input capacity ranges from 150,000 to 400,000 BTU. 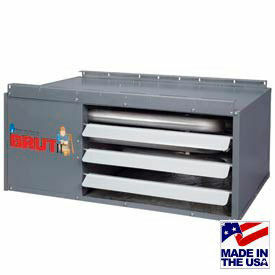 Output capacity ranges from 124,500 to 332,000 BTU. 1 Year Limited Warranty (10 Years Heat Exchanger). Dimensions vary per model. Modine Hot Dawg® Low Profile Gas-Fired Unit Heaters Are Used For Applications Including Residential, Hospitality, Commercial, And More. 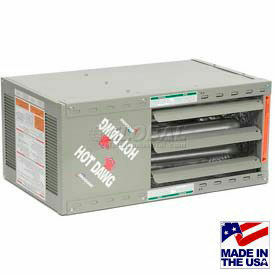 Modine Hot Dawg® low profile gas-fired unit heaters are made of steel for long lasting durability and dependability. Heaters provide optimal temperature and climate control for hotels, offices, rental properties, and more. Tubular heat exchanger with tubular in-shot burner ensures reliable performance and cost efficiency. Non-separated heaters draw makeup air from within structure or room for energy efficiency. Includes adjustable louvers and standard finger proof fan guard for safety. Small-diameter pipe simplifies side-wall or roof exhaust venting. Vibration free design reduces resonance for quiet operation. Accommodates field wiring connections with knockouts for convenient gas and electricity access. Must be installed by a licensed contractor. Fuel types are Natural Gas and Propane. Input BTUs range from 30000 to 125000. Output BTUs range from 24000 to 100000. Color is Gray. CSA certified. Dimensions vary per model. HeatStar Low Profile Gas-Fired Unit Heaters Provide Efficient Temperature Control for Residential, Commercial, and Light Industrial Environments. 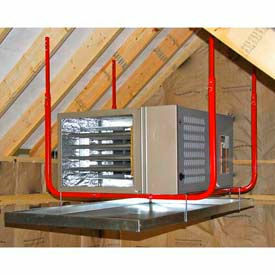 HeatStar low profile gas-fired unit heaters are made of steel for strength and durability. Heaters feature spark ignition, direct drive fan assembly, and self-diagnostic control modules. Aluminized tubular heat exchanger ensures maximum efficiency and unit longevity. Power exhaust supports vertical or horizontal venting. External access allows convenient thermostat control contact. Includes dual angle brackets for ergonomic ceiling mounting. 1" ceiling clearance required. Vent kits sold separately. Must be installed by licensed contractor. Fuel types are Multi and Natural w/ LP Conversion Kit. BTUs are 50000, 80000, and 125000. CSA certified. Dimensions vary per model. 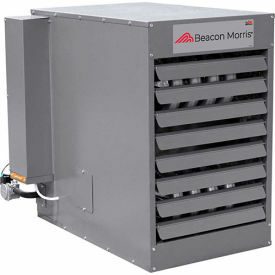 Beacon/Morris® Low Profile Natural Gas-Fired Unit Heaters Are Certified for Category I and III Venting. The Beacon/Morris low profile gas-fired unit heaters are made of 20 gauge steel cabinets with baked enamel finish for long lasting durability. Propeller unit combines tubular heat exchanger technology with a single-orifice burner system to provide optimal performance. 82% thermal efficiency, 115 V/ 1 Phase/ 60 Hertz. Control panel is easily accesed. Heater unit must be installed by a licensed contractor. 1 Year Limited Warranty (10 Years Heat Exchanger). Modine Hot Dawg® Low Profile Separated Combustion Gas-Fired Unit Heaters Are Used For Woodworking Shops Or Other Dusty Environments. Modine Hot Dawg® Low Profile Separated Combustion Gas-Fired Unit Heaters are made for long lasting durability and dependability. Lightweight design for easy installation 1 inch from the ceiling with 2 angle brackets. Can also be lowered using the threaded rod accessory kit. Separated combustion design uses fresh air for combustion instead of indoor space air. Optional concentric vent adapter accessory allows for 1 penetration through a sidewall or roof. Quiet operation. Factory configured for use with natural or propane gas. Certified for residential, commercial and industrial use. 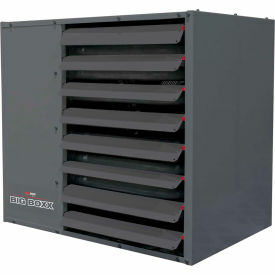 Gas, electrical and flue connections are easily changed by flipping the unit heater over and rotating spring loaded discharge louvers. Permanently-lubricated motor provides trouble-free dependability. 10 year parts warranty on heat exchanger, 2 year parts coverage on everything else. Available in models with input ranges from 3,000 - 125,000 BTUs and output ranges from 24,000 - 100,000 BTUs. Heat throw and air temperatures vary per model. Quick-Sling HVAC Hanging Systems Provide Safe, Secure Support For Air Handlers, Condensers And Other HVAC Components. Quick-Sling HVAC Hanging Systems are constructed using solid steel tubing for long lasting durability and dependability. Various types are available for stable, vibration-free installation of HVAC units and equipment. Available styles include Display Stand, Hanger Mount, Stand Unit, Swivel Mount, Mini Split Dual Fan Stand, Mini Split Stand, Pump Stand, Quick Stand, Quick Swivel and Vertical Air Handler Stand. Capacity ranges from 200 lbs. to 500 lbs. Dimensions and other specifications vary per model.